Your car’s spark plugs serve a critical function in your car. They ignite the mixture between air and fuel in your engine’s combustion chamber by delivering a electric current from the ignition system. This all translates to powering your engine and making your car go. 1. Auto Dealerships $175 – $240 – As most people already know, having your car repaired at a dealership may cost you a bit more than it would to have an independent auto mechanic perform the job. The good part about taking your car into a dealership is that you’ve got a much greater chance of the necessary parts being in stock. Also, you’ll be assured that the mechanic doing the work has been certified by the manufacturer to perform the work accurately. 2. Independent Auto Mechanic Shops $115 – $140 – Working with an indie auto mechanic has its perks. Not only is it a lot easier to develop a working relationship with the people in charge of doing the work on your vehicle, but you can also save a few dollars you’d otherwise spend by taking your car to a dealership. Before you have any work done on your car by an independent mechanic, check to make sure they’re qualified to work on your vehicle. 3. Do it Yourself $50 – $65 – Without a doubt, the cheapest route for any car repair is the DIY route (well, if you know what you’re doing). The only costs you’ll incur are parts. If you have the necessary level of experience to change your own spark plugs, you can save a fistful of cash. But if you’re not sure that you’re doing it right, it could be well worth the extra money to let a professional tackle the job for you. How Often Will I Need New Spark Plugs? Getting your spark plugs replaced isn’t something you need to worry about often. In fact, if “long-life” spark plugs are installed, plug manufacturers advertise a recommended plug interval change between 80,000 to 100,000 miles. How can a plug last that long? Long-life plugs are manufactured with Platinum or Iridium. Most new cars come with long-life plugs. With the average age of a vehicle on the road today now exceeding 11 years, long-life plugs many of them may not have had long-life spark plugs installed, so if your car is older, you may need to replace yours far sooner. Some spark plug manufacturers now advertise a lifespan between 80,000 to 100,000 miles! Click To Tweet Failing to replace spark plugs when necessary can result in a whole mess of not-so-good things to occur with your car, including poor performance, engine misfires during acceleration, hard starting, and the Mother of all undesirables – lousy gas mileage. Needless to say, these prices are only estimate averages. Depending on the kind of car you drive, the spark plug replacement cost could be far greater or significantly lower. Want to know out how much it would cost to replace spark plugs for your vehicle? 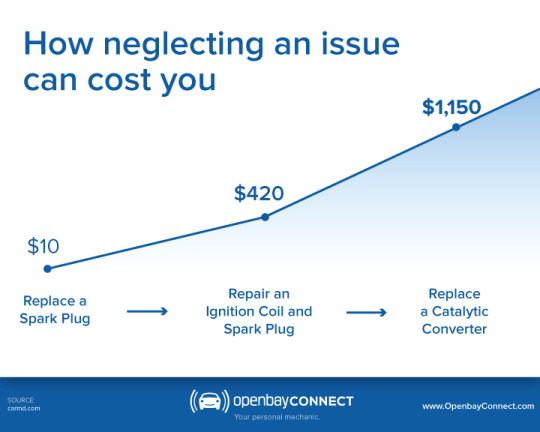 Use Openbay to quickly compare quotes and book service with top repair shops in your area. This entry was posted in Repair Services and tagged apps, boston.com, car repair, cars, find a mechanic, openbay, save money, spark plugs, trucks diy, vehicle repair. Bookmark the permalink.